This set of two Goldwood Sound SH-3025 black heavy duty steel pocket handles. Each handle is made of sturdy black steel. Simply install each handle to your speaker box or cabinet with you your own screws. These heavy duty handles allow portability for your cabinets without sacrificing style or performance. Brand: Goldwood | Manufacturer: Goldwood Sound, Inc. 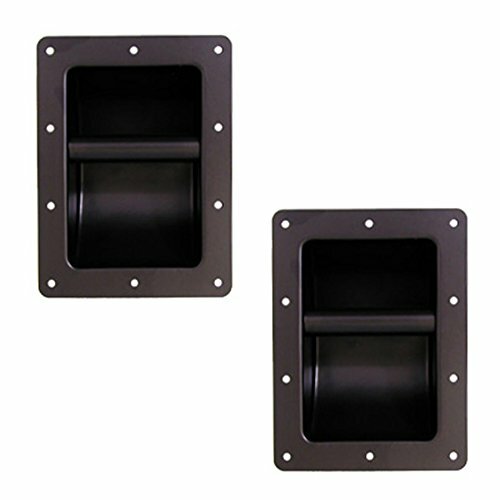 These Surface Mount Spring Loaded Speaker Handles are ideal for adding to your PA Speaker Cabinets or replacing old ones! Multiple screw points and durable rubber grips make carrying your speakers a little easier and more comfortable! The chrome finish makes these handles a perfect accessory to your PA Speakers giving them a clean, strong and professional look! Save and order these today! You can never have enough of these in your toolbox. 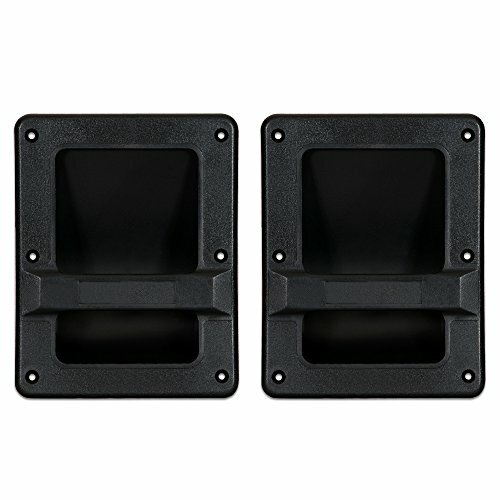 With your purchase, you will receive two Surface Mount Spring Loaded Speaker Handles. So, put it in your cart and be ready for what the road throws at you! 2 Nickel Recessed, Spring Loaded Handles Chrome Metal Comfort Rubber Grips Comfortable - Easy-to-grip rubber covering on handle makes carrying around comfortable Chrome finished steel handle and mounting dish can handle use and abuse will last a long time without ever getting any corrosion Dimensions: 4.88'' W x 3.20'' H - 5 Mounting Holes - 16 Gauge Plate Super strong and durable spring will last a life time without ever braking. 100% Satisfaction Guarantee Perfect Fit. You will love it or we will buy it back from you, no questions asked! Surface Mount Spring Loaded Speaker Handles Model: 21-828. Contents: Pair of Surface Mount Spring Loaded Speaker Handles for PA Speakers and Racks. Condition: New. 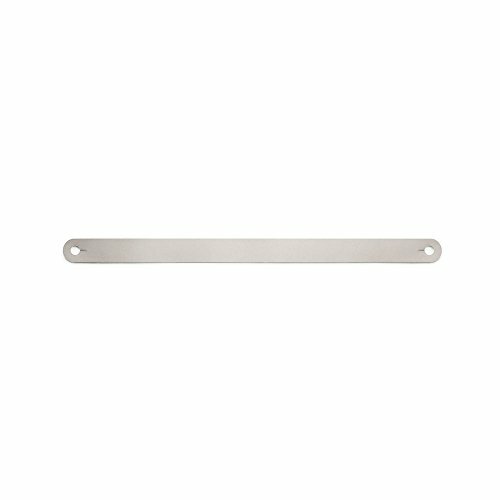 Dimensions: 5 1/2" x 1 5/8" Mounting Bracket. Features: Ideal for PA Speakers - Building your own or replacing old ones. Construction: Metal. Color: Black. Super strong and durable spring will last a life time without ever braking. 100% Satisfaction Guarantee Perfect Fit. You will love it or we will buy it back from you, no questions asked! 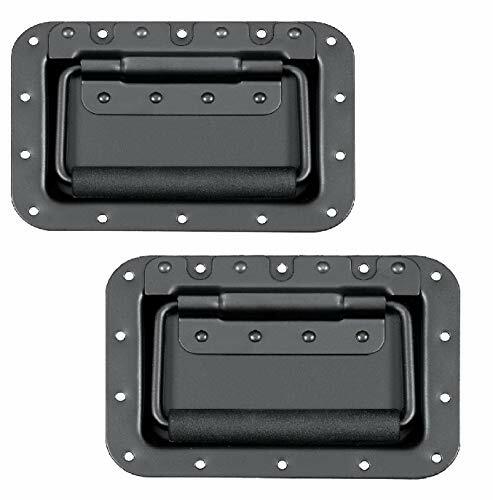 MIYAKO 21-805 set of two black heavy duty ABS Plastic pocket handles. 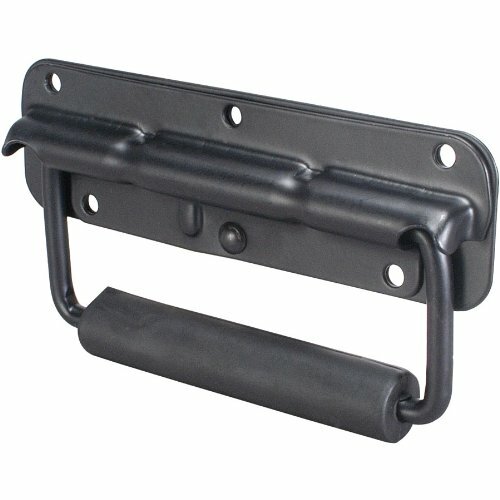 Each handle is made of sturdy black Plastic. Simply install each handle to your speaker box or cabinet with you your own screws. These heavy duty handles allow portability for your cabinets in a efficient manner thanks to its comfortable grip, without sacrificing style or performance. Save your fingers from calluses and pull even the heaviest of PA speaker cabinets, amplifier boxes or bass guitar cabinets with ease and comfort! 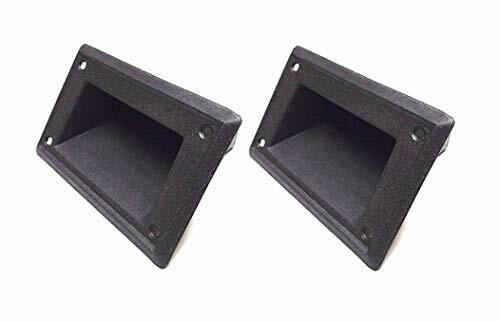 Perfect for DJs, musicians, school bands and any stage performer, these heavy duty, ABS plastic speaker cabinet handles will replace any old or worn out pulls on your road cases and allow you to carry them to your next gig with safety! Their recessed design allows for maximum weight load strength, so you can carry your heavy duty DJ gear without worrying about accidents. The pack includes 1 pairs of handles (2 pieces in total). Boasting a modern, sleek design with black finish, these sturdy speaker cabinet handles will ensure you of the perfect fit and an unbeatable style for all your projects. 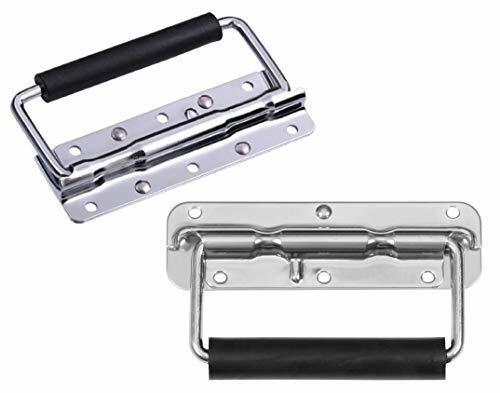 With 4 mounting holes for effortless and secure installation, you can easily mount these durable handles in just minutes and get ready for your next performance! 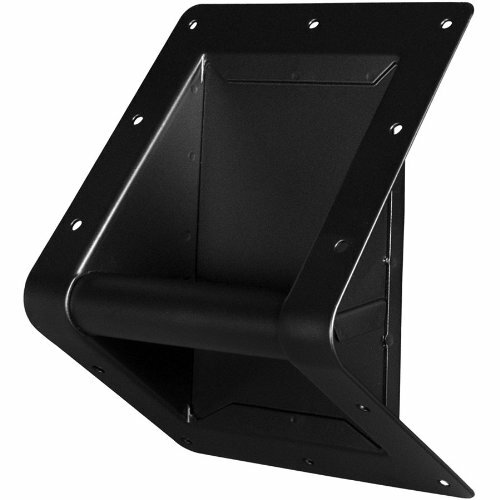 It's easier than ever to install a handle on your speaker enclosure, rack, or case. This surface mounted cabinet hardware requires no cutout. 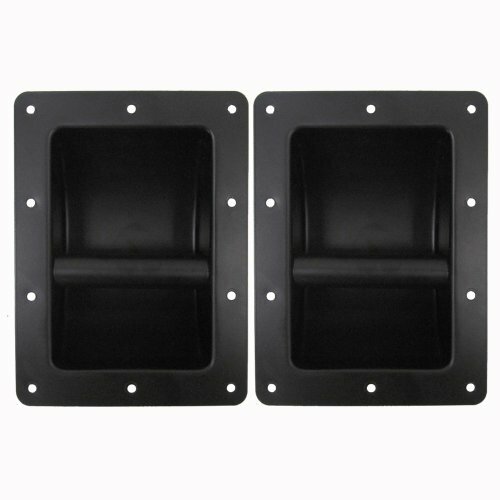 Pair of Metal Recessed Handles Metal Recessed handle 8 5/8" x 6 3/8" cut-out hole size: 4 5/8" x 6 3/4" Black in color Large Diameter bar for easy carrying This handle is brand new. One year warranty This listing is for two of these Seismic Audio metal handles. You will receive two identical handles, pictured and described above. 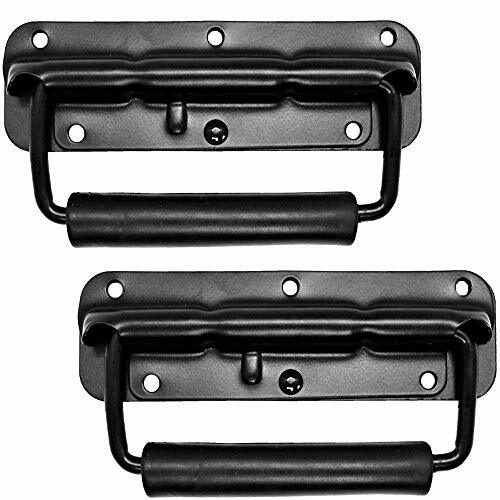 This set of two Goldwood Sound SH-3005 black heavy duty ABS pocket handles. Each handle is made of sturdy lightweight ABS plastic. Simply install each handle to your speaker box or cabinet with you your own screws. These heavy duty handles allow portability for your cabinets without sacrificing style or performance. 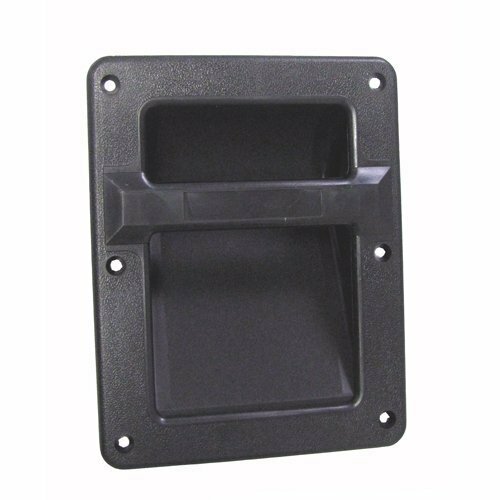 Our right angle speaker cabinet handle is all you need for tall, heavy PA enclosures. Just tip back that massive bass bin and roll it away! Steel Recessed, Spring Loaded Handles Black Metal Comfort Rubber Grip. The over dimension is 71/16 x 5" to be exact and the back recessed portion of the item is 5 3/4 x 3 3/4 inches. This Penn Elcom Spring Flex Cabinet Handle sets the industry standard for quality, durability and reliability. 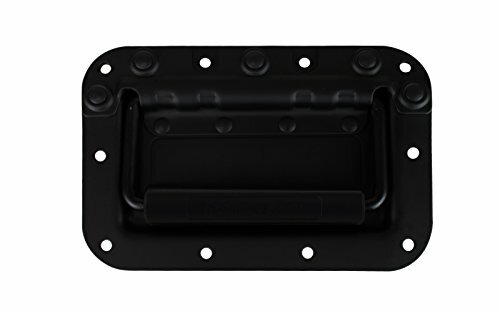 This rivet protected recessed handle is ideal for rolling and flight cases. Perfect solutions for any size flight or road case, tour equipment, etc. 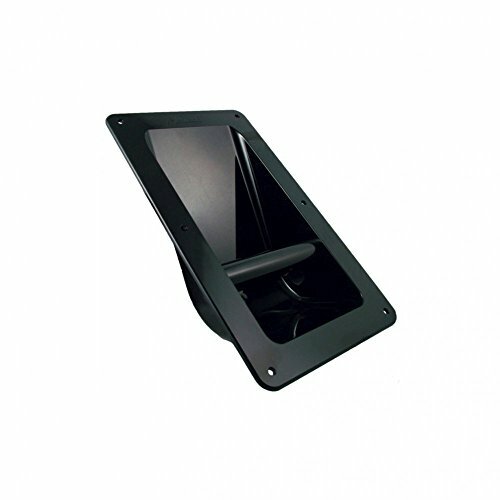 Replacement Strap Material: PVC, SPCC, Steel Strip Size: 20.1cm x 1.7cm x 0.6cm / 7.9'' x 0.7'' x 0.2'' Color: Black Suited For: Amplifier or speaker cabinets Include: 1pc x Black Rubber Strap Features: Practical and convenient. High quality and durable in use. Rubber Handle with Metal Insert. Black matt, sand surface treatment. Ideal For Speakers Or Musical Instrument Cases. 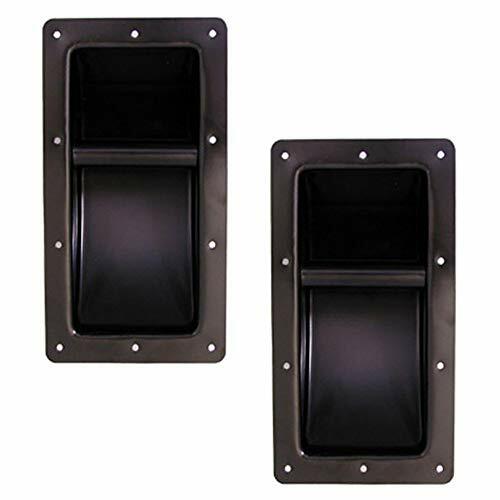 Two Steel Recessed, Spring Loaded Handles bar Black Metal Comfort Grips Dimension Extra Large 10-3/4" X 6-1/2"
Set of 2 Speaker Cabinet Handles Surface Mount Spring Loaded PA Flip Black Metal Handle 5 9/16" X 1 3/4"
Recessed plastic side handle for cabinets. Outer Dimensions: 6.19 x 10.63. Molded with a 1.75 Marshall logo. Choose one or more of the leather straps to customize your Beloit speaker. Made in Denmark with emphasis on craft, sound, design.